Philadelphia, PA – Governor Tom Wolf joined Representative Mike O’Brien and Philadelphia Mayor Jim Kenney today for a ground-breaking ceremony to announce a $3.5 million state grant for the first phase of the transformation of the former elevated Reading Railroad Viaduct into a public amenity and park. The first phase of the project will redevelop both the 1300-block of Noble Street and the elevated portion of the viaduct that runs from 13th and Noble Street to Callowhill Street. “This project continues William Penn’s vision of urban green space while being mindful of Philadelphia’s industrial past,” Rep. O’Brien said. The Viaduct was built at the end of the 19th century to transport passengers to the northern and western suburbs. It was rendered obsolete through the completion of the Center City commuter tunnel, and carried its last train in 1984. The portion south of Vine Street was demolished to accommodate the construction of the Pennsylvania Convention Center. Though the pedestrian bridge that links the renovated Reading Headhouse to the 1993 portion of the Convention Center was the first creative repurposing of the historic asset, the remaining portion north of Vine Street has inspired many design ideas, but has remained a blighted eyesore over the last three decades. 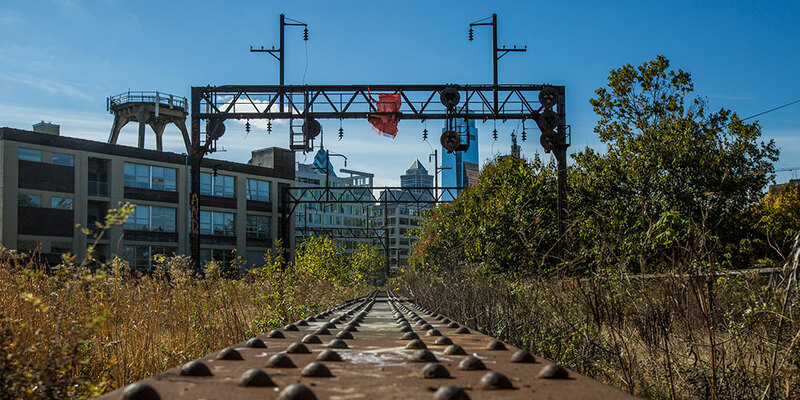 The success of New York City’s High Line, however, prompted renewed interest in Philadelphia’s elevated tracks both as a public park and as a catalyst for redevelopment of the surrounding neighborhood. Beginning in 2010, with support from the William Penn Foundation and the Poor Richard’s Charitable Trusts, the Center City District began working in partnership with the community-based Reading Viaduct Project, the City’s Commerce Department, and the Department of Parks & Recreation to evaluate the options for the abandoned Reading Railroad Viaduct that runs north in two segments: to the 800 block of Fairmount to the east, known as the Main Branch; and from Vine Street to 13th and Noble Streets to the west, known as the SEPTA Spur. The Main Branch is approximately 4/5 of a mile while the Spur is 1/5 of a mile. The $3.5 million state grant will be allocated toward Phase 1 of the project, allowing CCD to finally break ground. Other financial support has been provided by the City of Philadelphia, the William Penn Foundation, the Knight Foundation and a large number of individual and business donors. The $10 million project that will be complete in early 2018.